The Nieuport 24 introduced a new fuselage of improved aerodynamic form, rounded wingtips, and a tail unit incorporating a small fixed fin and a curved rudder. The tailskid was sprung internally and had a neater appearance than that on earlier Nieuports. A 130 hp Le Rhône rotary engine was fitted. In the summer of 1917, when the Nieuport 24 and 24bis. were coming off the production line, most French fighter squadrons were replacing their Nieuport 17s with SPAD S.VIIs – and many of the new fighters went to fighter training schools, and to France’s allies, including the Russians, and the British, who used theirs well into 1918, due to a shortage of S.E.5as. 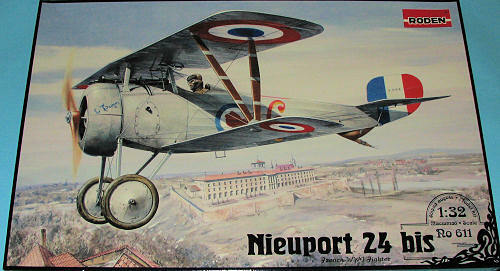 A few French units retained the Nieuport through late 1917 – the type was actually preferred by some pilots, especially the famous Charles Nungesser. Nice to see that Roden has decided to upscale its 1/72 kit to 1/32 scale. 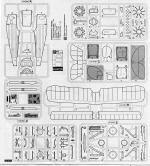 As you have heard before, many modelers find this scale to be perfect for the small and basic aircraft that flew during WWI and I have to agree with them. You get a goodly amount of detail without delving into the major 'fiddly bits' genre. As with all newer Roden kits, the molding is superb. You get fill cockpit detailing, including a seat whose backing piece you bend around the seat bottom. Sidewall detail is included as well for this as well as all the proper controls and levers. You get a multi-piece rotary engine with separate cylinder heads. In fact, you get variations of the engine hub on which the prop is attached. The two piece cowling is also well detailed. You are provided with three propellers, but no indication as to which is used with which markings option so the choice is yours. Control line rods and bell cranks are provided and there is a nicely detailed landing gear assembly. My minor experience in building these types of aircraft is that they seem fragile and 'wiggly', but once the glue sets, they are very sturdy, especially once they are rigged. Some parts on the sprues are not used for this version. I should also mention that there is an acetate sheet provided for three different shaped windscreens. Only one is shown as being used in a frame, yet all three are on a sheet marked for this boxing. Decals and painting reference for 5 aircraft, in no particular order: N3305 assigned to pilot Corporal Six of Escadrille N.159, Aeronautique Militaire, February 1918; N3263 assigned to an unknown training squadron of the US Air Service, France, late 1917; unknown serial flown by Ivan Pavlov, CO of the 1st Soviet Fighting Air Group, Battle of Kazan. Swiyazhsk airfield, August 1918; N5086, pilot Lt Juliusz Gilewicz assigned to the 5th Squadron, Polish Air Force, 1919 and N4300 flown by Lt Janis Prieditis, Latvian Air Service, Spilve airfield, Riga, August 1919. 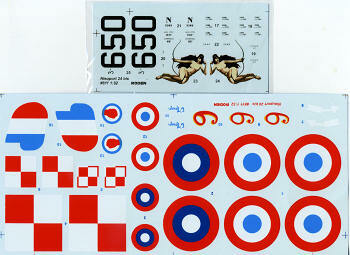 Both the very large and smaller decal sheet are superbly printed with no registration issues at all. Instructions are typical of what we have come to expect from Roden. The construction drawings are superbly done and we are provided with both Model Master and generic color references. As the Latvian markings will have to be painted on, Roden provides exact dimensions for this as well as a rigging guide. This appears to be one of the simpler rigging jobs around, making this kit a natural for a first time or hesitant biplane builder. 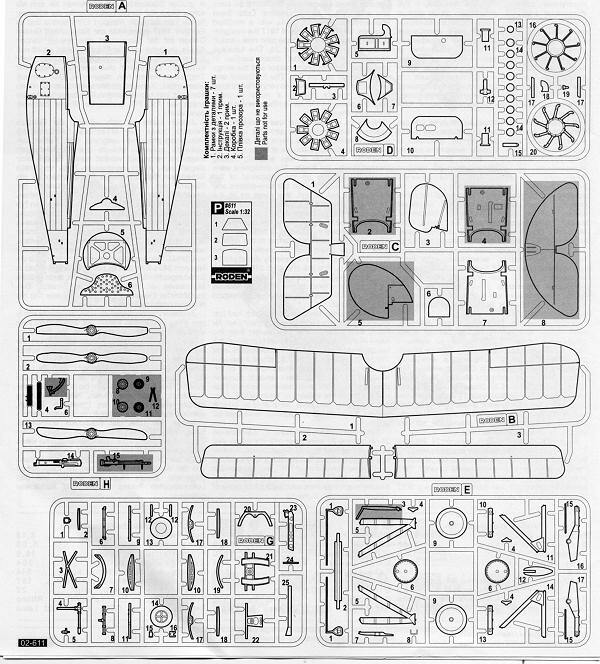 A very nice addition to Roden's 1/72 WWI line-up of kits and a plane that never really got a lot of press. I think you'll like it. Thanks to Squadron Products for the preview kit. Get yours at your favorite retailer.